Johannes Mashego Segogela had no formal training as an artist and initially did an apprenticeship as a boilermaker. He became a full-time artist in the early 1980s. For the last twenty years the Goodman Gallery, Johannesburg has provided him with financial and artistic support. In a sense, then, Segogela’s relationship with the city and the art market is different. The most remarkable feature of Segogela’s work is its scale; some of his works can even fit into the palm of a human hand. It is scale matched with attention to detail, and reveals a close observation of life. Features on faces, clothing buttons, ties and especially shoes are rendered with care. Over time a few slightly larger figures were carved but these were seldom more than 45cm high. Segogela carved single figures or groups arranged in other configurations (like the ensemble in the Campbell Smith Collection) (plate 269); later in the early 1990s he made intricate and elaborate group compositions or tableaux in which each small figure was placed as though in a stage-set. Its role was prescribed by the subject and its place in the narrative. The most famous of these ensembles is entitled Death (and burial) of Apartheid. In his early works the surfaces were finished with sandpaper; later they were covered with a clear wood varnish with some parts, such as hair and shoes, differentiated by using colour. In time, more and more colour was used in ways that referred to nature or are underpinned by religious content. His trees are green, his clothing life-like; angels are dressed in white and his devils are painted black. The iconography of Segogela’s work is essentially religious. Like Hlungwani (qv.) he regards his work as ‘a means of proselytising the public into the Christian faith’.1 However, many of these themes are adapted – and the modern world intrudes in the most engaging and witty ways. In one work, for example, angels record on video camera an epic battle ensuing between the devil and another angel. And Nelson Mandela, astride a leopard, tops a walking stick in a contemporary reworking of traditional walking sticks from the region. Goodman Gallery, Johannesburg; notes on the artist, undated. Born 1936 Sekhukhuneland, Northern Province. Exhibitions 1985: Tributaries, Africana Museum in Progress, Johannesburg and Munich, Germany. 1985: Transitional Art, Goodman Gallery, Johannesburg. 1986 ongoing to 2004: regular exhibitions, Goodman Gallery, Johannesburg. 1988: The Neglected Tradition, Johannesburg Art Gallery. 1989: Images of Wood, Johannesburg Art Gallery; Ten Years of Collecting, University of the Witwatersrand. 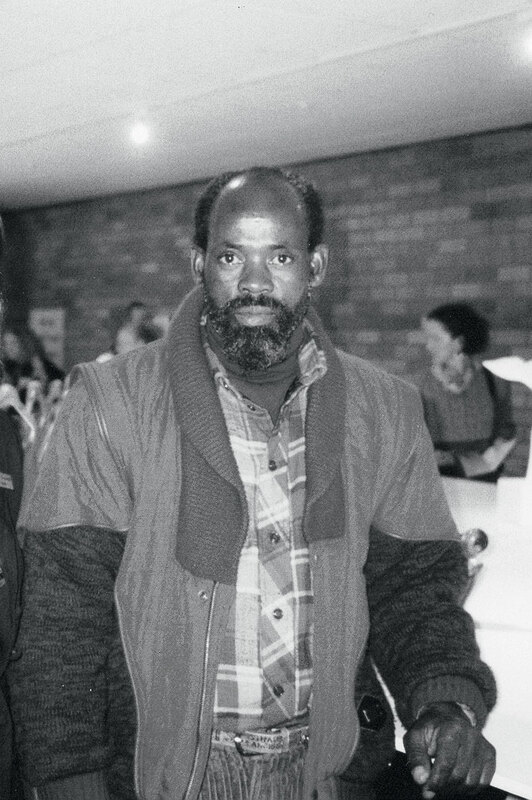 1993: Heroes with Willie Bester and Tommy Motswai, Goodman Gallery, Johannesburg. Zuiderkries, Stedelijk Museum, Amsterdam, Holland. 1994: 5th Havana Biennale, Cuba; Group Exhibition, La Defense, Paris. 1995: Guest Artist Award, Standard Bank National Festival of the Arts, Grahamstown; Africa ’95 (solo exhibition) The Serpentine Gallery, London, UK; Siyawela: Love, Loss and Liberty in South African Art, Birmingham, United Kingdom, Africa ’95 Festival. 1996: University of the Witwatersrand Art Gallery. 1998: Cram: The Cream of South African Art, Association of Arts, Cape Town. 1999: Images of Wood, Johannesburg Art Gallery. 1999: Artery (two person show) Mark Coetzee Fine Art Cabinet, Cape Town; Art First Gallery (solo) London. 2000: A World of Christians, Nordjyllands Kunstmuseum, Denmark. 2001– 2003: Motho ke motho ka batho (see Seoka). Collections Iziko SA National Gallery, Cape Town; University of the Witwatersrand; Johannesburg Art Gallery; Tatham Art Gallery, Pietermaritzburg; Mercedes Benz Collection, South Africa; Durban Art Gallery; Pretoria Art Museum; CAAC, J. Pigozzi, Geneva; Fowler Museum, UCLA, California; Schindler Lifts, A.G. Switzerland and numerous private collections. Photograph of Johannes Segogela. Courtesy of Neil Dundas, Goodman Gallery, Johannesburg.